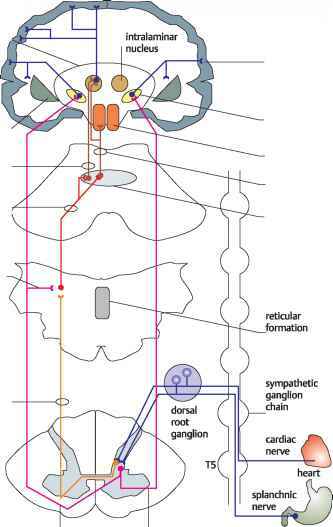 Afferent nociceptive inputs to the dorsal horn are carried by the AS and C fibers. AS fibers terminate in laminae I and V, and C fibers in laminae I and II (substantia gelatinosa). Upon entering the cord, the fibers bifurcate or divide into collaterals, which may synapse with neurons in the dorsal horn, or ascend one or more segments in the Tract of Lissauer (see also p. 156) before entering the cord to synapse. There are many interneurons linking the two layers, and these interneurons serve to modulate the release of neuro-transmitters from the afferent terminals. In addition, descending fibers from the brain, and particularly from the nucleus raphe magnus, terminate in these layers, and these modulate the activity of the in-terneurons to control and limit the afferent input of nociception to the brain. In summary, there are three main types of pathways in the dorsal horn for transmission of nociceptive signals. (i) Nociceptive afferents from the periphery may synapse directly with neurons of the ascending an-terolateral pathway. 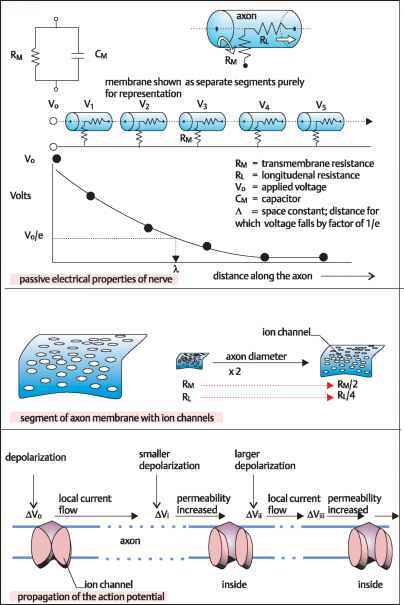 (ii) The afferents may synapse with excitatory interneurons, which relay nociceptive inputs to ascending fibers. (iii) Afferents may synapse with inhibitory inputs which inhibit or block altogether the transmission of the noci-ceptive impulse. Knowledge of these interconnections is useful when attempting to understand the clinical implications of pain, such as, for example, referred pain (see p. 174), and the effects of nerve damage on the transmission or lack of transmission of pain within the spinal cord. This knowledge has also given rise to theories of pain transmission to the brain, the best known being the gating theory of pain. ents, and stimulation by the smaller incoming nociceptive fibers. Thus, Aa+ afferents stimulate inhibitory interneurons in lamina IV, which inhibit afferents in I and II, which in turn inhibit the firing of the spinothalamic (anterolateral) fibers which carry nociceptive impulses up to the brain. For example, the application of mechanical pressure such as rubbing, or of heat to the skin (Aa), will decrease the conscious perception of an applied noxious stimulus such as a pinprick, to the skin. Conversely, if the painful input (AS, C) is strong enough, it will overcome the inhibitory influence of the interneurons activated by Aa afferents. There are several ascending nocicep-tive tracts projecting from the laminae to the brain. The most prominent is the spinothalamic (anterolateral) tract (see also p. 160), originating from neurons in laminae I and V-VIII, and terminating in the thalamus. The spinoreticular tract (see p. 164) originates in laminae VII and VIII, and sends projection neurons that terminate either in the reticular formation or the thalamus. The spinomesencephalic tract originates in laminae I and V, and projects to the mesencephalic reticular formation, the lateral portion of the peri-aqueductal gray matter (PAG), and to other sites in the midbrain. Other neurons project from laminae III and IV in the spinocervicothalamic tract, while some run from III and IV to the gracile and cuneate nuclei. The transmission of nociceptive impulses to the brain is controlled by the brain through modulatory circuits within it and through descending pathways that synapse with the various relay nuclei from the dorsal horn upwards. The main central components known to modulate nocicep-tive transmission through descending pathways include (i) the somatosensory cortex, (ii) the thalamus, (iii) the hypothalamus, (iv) the midbrain periaque-ductal gray matter, (v) the nucleus raphe magnus in the medulla, and (vi) interconnections within the dorsal horn (see also p. 168). An important efferent pathway is that from the periventricular nucleus of the hypothalamus to the periaqueductal gray matter (PAG). The pathway utilizes the endogenous opioid, enkephalin, as neurotransmitter. Enkephalins are small peptides that bind to the morphine receptor subtypes and are thought to be of major importance in the control of pain from the dorsal horn upwards. Fiber tracts descend from the PAG to the nucleus raphe magnus, where they form excitatory sero-tonergic synapses. The tracts also exert their excitatory action through inter-neurons, which have been shown to release one or more of a variety of putative neurotransmitters, including glutamate, neurotensin, and somatostatin. From the nucleus raphe magnus there is a descending pathway, the raphespinal tract, which projects to the dorsal horn, to laminae II and III. This synapses with enkephalinergic interneurons, which in turn act both pre- and postsynaptically to inhibit the transmission of nociceptive impulses to the brain through the spinothalamic and other tracts. 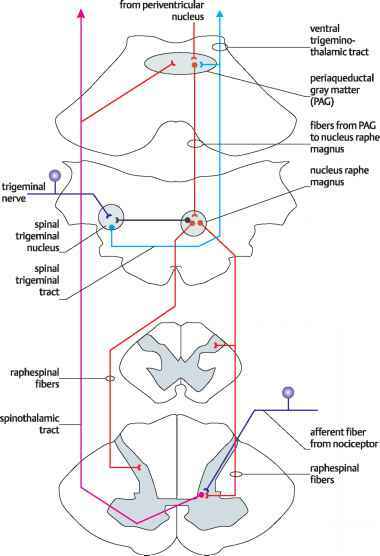 In addition, there are fiber tracts directly from the hypothalamus to the dorsal horn (hypothalamospinal tract), and from the PAG to the dorsal horn (see p.
166). It has been discovered that both cholecystokinin and substance P are released at terminals where PAG fiber tracts terminate in the dorsal horn, and may be neurotransmitters mediating the inhibitory action of PAG projection fibers on nociceptive transmission. Knowledge of the existence of these descending pathways from the brain has prompted the use of electrical stimulation of areas, or stimulation-induced analgesia (SIA), in the hope that these will help to alleviate chronic pain, admittedly with highly variable success rates. Also, knowledge of the neurotransmitters involved has resulted in the use of exogenously applied synthetic opioids, applied either systematically, or locally to the spinal cord by epidural injection, in the hope that these will produce analgesia. The validity of the gating theory of pain (see p. 168) is supported by treatments in which the dorsal columns are stimulated by chronically implanted electrodes. This produces an anti-dromic firing of the column fibers resulting in the stimulation of inhibitory enkephalinergic interneurons in the dorsal horn, which in turn blocks nociceptive transmission. It is possible that techniques such as acupuncture also stimulate descending pathways and enkephalinergic interneurons to produce relief from pain. Inputs, including nociceptive inputs from the external environment, are detected by cutaneous receptors and relayed to the brain via the spinal cord and the various ascending pathways. At the same time, the brain continuously receives sensory information from the internal environment from visceral receptors and the visceral afferent pathways. Visceral receptors have been classified as one of two main types, nociceptive or physiological. The physiological receptors may be rapid or slowly adapting mechano-receptors, baroreceptors, chemoreceptors, osmoreceptors, and thermal receptors. Nociceptors are free nerve endings that transmit stimuli that are ultimately perceived as, for example, visceral bloating, GIT cramp, appendicitis, or cardiac ischemia. The afferent fibers that transmit visceral sensory information travel in the nerves of the sympathetic and, more commonly, of the parasympathetic system. Traditionally, these were thought to comprise only efferent fibers, but are now known to contain afferent fibers as well. For example, over 80% of the fibers in the vagus nerve (see p. 228) are afferent viscerosensory fibers. However, almost all the nociceptive input to the CNS is transmitted through sympathetic nerves. send projections to VII and VIII as well. The cells in laminae I and V that synapse with these inputs join the contralateral spinothalamic (anterolateral) tract, while those in laminae VII and VIII send projections bilaterally in the spinoreticu-lar tracts. Cells of the spinothalamic tracts that receive sympathetic viscerosensory noci-ceptive inputs in laminae I and V either cross in the ventral white commissure and ascend contralaterally, or ascend on the ipsilateral side. On both sides, the ascending fibers terminate in the thalamus in the ventral posterolateral (dorsolateral) nuclei, from where fibers ascend to the parietal operculum in the inferolateral part of the postcentral gyrus and to the insular cortex. In contrast to the exquisitely accurate nature of cutaneous nociceptive localization achieved by the cortex, that of visceral localization is relatively poor, due to low density of visceral nociceptors, and to the relatively large receptive fields. Other ascending pathways, the spinoreticular fibers, arise in laminae VII and VIII (see also p. 164) and terminate in the reticular formation. From here, reti-culoreticular fibers ascend to the peri-aqueductal gray where they terminate on cells, which project as the reticulo-thalamic fibers to the thalamus, while others terminate in the hypothalamus. The reticulohypothalamic fibers travel to the hypothalamus and have important functional implications. For example, increased heart rate can result from abnormal bowel distention. collateral from spinothalamic tract spinoreticular fibers"
Referred pain is the sensation of pain in an area of the body distant from the site of origin of the original nociceptive receptor activation. 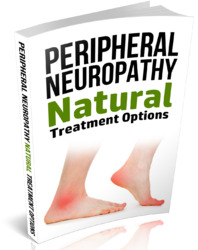 Most commonly, it is the experience of cutaneous, muscle, or bone pain through activation of visceral noci-ceptor nerve endings. 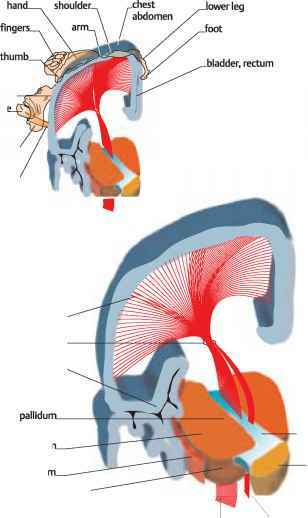 The phenomenon of referred pain occurs through the existence of common central points of convergence of nociceptive afferent inputs from the viscera and somatic structures. Referred pain can be explained through knowledge of the spinothalamic tract. This is because the same second-order neuron receives inputs from the viscera (e.g. the heart) and the skin. Thus, when viscera are diseased (e.g. myocardial infarction), the brain may interpret the pain as coming from the left arm. Similarly, injury to the diaphragm may be perceived as a pain below the right shoulder blade. This phenomenon has useful diagnostic value. If a second-order neuron of the spinothalamic tract is being stimulated by nociceptive impulses from (say) heart, then touching the area of skin which sends afferent inputs to the neuron may also cause pain, even with a relatively light touch, because the second-order neuron has already been excited by the input from the heart noci-ceptor. In the heart, for example, the condition known as angina is characterized by a constricting pain felt by the patient behind the sternum and often radiating down the left arm and sometimes up into the throat, and, rarely, down the right arm. Since cardiac disease is more commonly confined to the left side of the heart, this would explain the bias of referred cardiac pain to the left somatic structures. The heart sends nociceptive afferents to the spinal cord through the cervical and thoracic cardiac nerves. 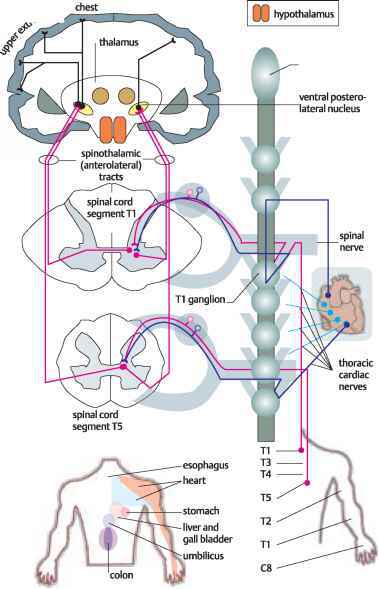 These enter the sympathetic trunk and the cervical nerves join the superior, middle, and inferior sympathetic ganglia, while thoracic nerves enter the thoracic ganglia from T1 through T5. Ultimately, these primary afferents terminate in the dorsal horn in laminae I and V. It is here that referred pain mechanisms originate, because the nerve cells in these laminae also receive nociceptive cutaneous afferents from the dermatomes (see p. 154) in the left arm and chest wall. Other second-order neurons in these laminae in other spinal segments may also be activated through the activation of collaterals running from segment to segment. Thus, the soma-tosensory cortex eventually receives noci-ceptive information from the heart, which it may interpret as having originated in the chest wall and upper limb. The same principle underlies referred pain from other visceral structures. The sites of referred pain from bladder, kidney, liver, and colon, for example, have been mapped to areas on the trunk. Ascending somatosensory projections are relayed, ultimately, to specific regions of the cerebral cortex, specifically to the parietal lobe, which lies behind the frontal lobe (see also p. 338), and which is bounded inferiorly by the temporal lobe and posteriorly by the occipital lobe. 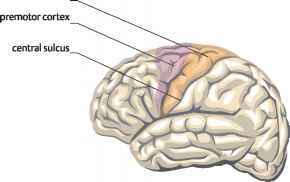 This region is the primary somatosensory cortex, also called area SI, or Brodmann's areas 1, 2, and 3 (see p. 336). 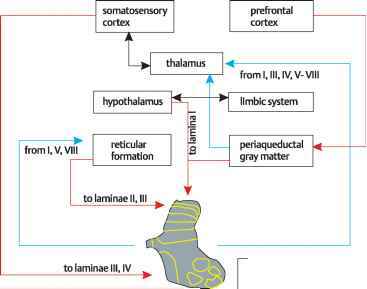 The somatosensory cortex has been mapped in relation to the inputs it receives from the ventral posterior nucleus of the thalamus. The cortex preserves the original topographical organization of skin with respect to the various modalities of sensation; the organization of the somato-sensory cortex faithfully represents the contralateral area of skin. The somato-sensory cortex thus is the final destination of afferent inputs carried by the medial lemniscus (proprioception and fine touch), trigeminothalamic (sensation from the head region), spinal lemniscus (coarse pressure and touch), and the spino-thalamic tracts (temperature and pain). There is a smaller somatosensory area, termed SII, found in primates, which is different from area SI in that it receives so-matosensory inputs from both sides of the body, and in terms of some of the modalities it receives. Area SII is located on the medial surface of the parietal operculum, and receives a much larger nociceptive input from the thalamic nuclei than that received by area SI. During PET scans of the brain area SII is highlighted when the subject experiences painful peripheral stimuli. Areas SI and SII are known to coordinate activity in the process of tactile discrimination by the brain. The area of cortex that subserves a particular cutaneous area is not proportional to the size of the body surface it represents; the size of the area reflects the density of cutaneous receptors. For example, the lips, which are richly innervated with sensory receptors, are represented in the somatosensory cortex by a disproportionately high area. Similarly, the palmar surface of the hands, the digits, and particularly the thumb, the tongue, pharynx, and the face are well represented in the somatosensory cortex. Conversely, relatively large body surfaces such as the limbs, which are not richly innervated, have far smaller area of somatosensory cortex devoted to their afferent input information. The arrangement of the topographical somatosensory cortical map has several interesting features, especially in clinical situations. For example, it should be noted that the representations of the digits and the face are close together. Patients who have undergone upper limb amputation report that they have experienced so-called 'phantom finger' sensations when touching their faces on the same side as the amputation. This phenomenon, which may be reported within two or so weeks of amputation, probably reflects the unmasking of overlapping, pre-existing areas served by neurons projecting from the thalamus to the cortex. Damage to the somatosensory cortex is associated with partial seizures. So-called sensory seizures, which are sensations passing down the contralateral side of the body, are experienced. The primary motor cortex (Brodmann's area 4; see p. 336) is somatotopically arranged as a contralateral motor map of the body. The representation of the head is found laterally, close by the lateral fissure, and the hands, limbs, and trunk lie more medially. 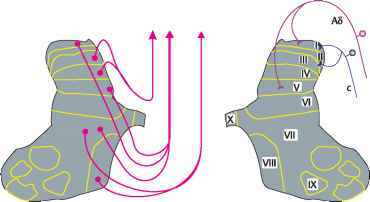 These areas were mapped by stimulating areas of the motor cortex and observing the movements of the muscles. They were also elucidated as a result of the observation of the spread of seizures from distal sites such as fingers, up the arms and to the trunk, which reflected the spread of seizure activity in the motor cortex. As with the somatosensory cortical map, the distribution of brain areas is disproportionate in size. Areas of the body that require greater precision of movement, such as the face, thumb, fingers, and hands, have a much larger area of motor cortex dedicated to their control than do the trunk or the limbs. Adjacent to the primary motor area is the premotor area (Brodmann's area 6). Stimulation of neurons in this area also elicits motor movements in the body. These neurons project axons to the primary motor cortex, to subcortical areas, and through to the spinal cord. Two main pre-motor areas have been described. These are the premotor cortex (also referred to as MII), which lies on the lateral surface of the hemisphere, and the supplementary motor cortex, which has also been called the secondary motor cortex. The supplementary motor cortex lies on the superior and medial aspects of the hemisphere. It is interesting that in all primates, the size of the primary motor cortex in relation to body weight is constant for all species, whereas the size of the supplementary motor cortex is disproportionately much larger in humans than in other primates. There is another difference between the primary and premotor areas, in that stimulation of primary motor units will elicit relatively precise, well-defined movements on the contralateral side of the body, while stimulation of premotor units generally elicits more complex movements. These movements are coordinated and generally involve contractions of muscles at more than one joint. When the supplementary motor areas are stimulated, these movements can also occur bilaterally. In addition to these differences between primary and premotor cortex, the premotor units require greater stimulus currents to generate impulses that will result in body movements. Premotor areas may occur elsewhere in the brain. For example, there are areas of the cingulate gyrus, which is a form of primitive cortex, whose function may be related to the role of motivation, i.e. emotional status, in the planning of motor movements. Inputs to the motor cortex have been described (see p. 30), but it is worth summarizing here that the motor cortex receives its inputs from three main sources. These are (i) the peripheral body via the thalamic relay nuclei-somatosensory cortex system, from the premotor cortex, and from the sensory association areas of the cortex, (ii) from the cerebellum, and (iii) from the basal ganglia. The pyramidal tract, or corticospinal tract as it is also known, carries from the cerebral cortex the impulses that make possible the execution of precise voluntary movements. The tract is made up of axons that originate from cell bodies, or peri-karya, or neurons in the cerebral cortex. It is the only pathway whose axons pass uninterrupted by any synapses from the cerebral cortex to their ultimate destinations in the spinal cord. It is called the pyramidal tract because of the shape of the pyramidal cell bodies or perikarya from which the axons originate. The term pyramidal is also used in connection with this tract to describe an area of the ventral surface of the medulla oblongata where the pyramidal tract crosses over (decussates) to the other side of the spinal cord (see p. 6). It has been estimated that there are around 1 million fibers in the pyramidal tract. Many, perhaps most, of the axons of the pyramidal tract originate in the primary motor cortex, which is situated in the pre-central gyrus (see p. 338). Many axons, however, arise outside the primary motor cortex; these areas include the area in front of the central sulcus, and in areas SI and SII (see p. 176). All the axons of the pyramidal tract originate from cell bodies lying in layer 5 of the cerebral cortex, and, contrary to some earlier reports, not all are the giant Betz cells. The axons of the pyramidal tract leave the cortex and converge through the corona radiata of the cerebral white matter and pass into the posterior limb of the internal capsule. As they pass through, they retain the original somatotopic organization. Note that there are several other pathways through the internal capsule, and the pyramidal tract constitutes a minority of these fibers. For example, fibers descend from the cortex to the mid-brain; fibers ascend from the thalamus to the cortex; the optic radiations to the occipital cortex pass through the internal capsule. Therefore injury to the internal capsule may result in both sensory and motor disturbance. The fibers pass into the midbrain or mesencephalon, where they spread out to mingle with various other tracts in the middle two-thirds of the crus cerebri (see p. 6), and from there, they pass down to the medulla, where, as mentioned above, decussation may occur. After de-cussation, the fiber bundles descend as the lateral corticospinal tract (see also p. 182), and the tract gradually lessens in thickness as fibers leave it on its way down to the lumbar spinal cord. Not all of the fibers of the pyramidal tract are destined for the spinal cord. At the level of the midbrain, a bundle of fibers splits off to form the corticonuclear or cor-ticobulbar tract, which will pass down to the nuclei of the cranial motor nerves (see p. 182). These fibers control muscles of the head, i.e. 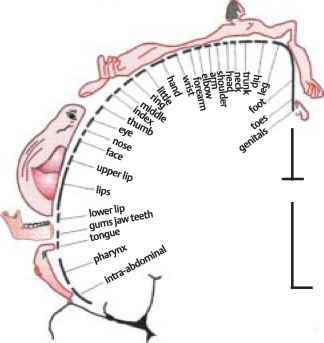 the face, pharynx, tongue, and the larynx. Some of the fibers of this tract will decussate, but others will innervate cranial nerves ipsilaterally. internal capsule head of caudate nucleus jaw. Which type of fibers are present in hypothalamospinal tract? What area of the cerebral cortex receives sensations from visceral receptors? 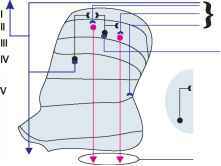 Which area of cortex ascending tracts terminate? How much gyrus is dedicated to the trunk? 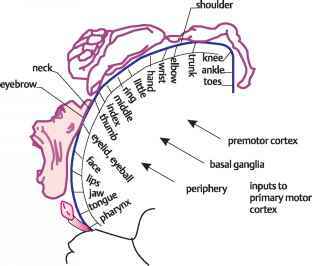 What percentage of the precentral gyrus is dedicated to the face?